Although the designer of the professionally crafted course at Orchard Greens Golf Club is not known, what is well known about the club itself is that it is situated right in the centre of an orchard that has been in operation for decades. In fact, the course restaurant, BunkHouse Bar and Grill, was originally built way back in 1929, used first as a shed and horse barn and then as a living quarter for workers. It wasn't until 1990 that it was transformed into what course goers see today when visiting Orchard Greens. Orchard Greens Golf Club features a fully optimized practice green that will allow you to work on every aspect of your golf game. You can start by teeing off to practice the crucial mechanics behind any good driving swing. From there you'll be looking at a putt, chip shot, pitch shot, or bunker shot, all of which you'll be able to work through any number of times so that you're as prepared and loose for your first official tee shot at hole number one. While lessons are not available at Orchard Greens Golf Club, there is an extensively stocked pro shop that features everything you would ever need for a day out on their course. Golf clubs, bags, gloves, shirts, pants, shorts, tees, shoes, hats, and sunglasses; it's all there on site available for purchase. If it has anything to do with the sport of golf, Orchard Greens’ pro shop will have it on hand. Before or after your game, you can visit the restaurant at Orchard Greens, which is called The BunkHouse Bar and Grill. The restaurant is primarily divided into two sections: one side for the bright and well-aired pub and another side for the more welcoming living room style dining area. Whatever you're craving at breakfast, lunch, or dinner, The BunkHouse can serve you your favourite dish or something entirely different. Their menu includes traditional breakfasts, omelettes, eggs, pancakes, steak, sandwiches, wraps, burgers, soups, salads, chicken, and a variety of great drinks. 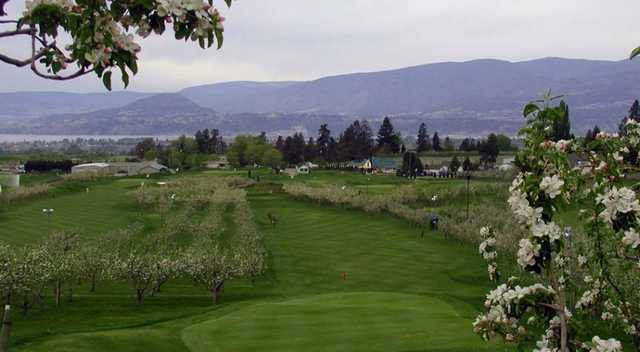 As can be gathered from the club name, Orchard Greens Golf Club is unique in that the entire span of its course is built around an operational Okanagan orchard. The different fairways and greens on each hole all cut straight through the trees of the orchard itself, which leaves a number of beautiful thickets around the course perimeter. Additionally, the 9th hole offers one of the best views you'll get anywhere in the valley. The elevated tee leaves the surrounding vista of mountains, lake, city, and valley all on display for you to enjoy. You'll be sure to gain a new sense of appreciation for how uniquely situated the course is once you have a look around before taking your driving shot down range. Finally, for a different golfing experience, Orchard Greens Golf Club is the only such club in all of the Okanagan that actually offers players the chance to tee off during the night. The floodlights go on and the entire course is illuminated to add not only a new layer to the game but also a distinct perspective on the scenery.